Our product range includes a wide range of women bridal footwear, bridal footwears and designer bridal footwear. Backed by a team of skilled engineers, we are highly engaged in exporting and supplying of Women Bridal Footwear. Specially designed keeping in mind the bridal needs, our vendor’s workforce manufactures these bridal footwear by using high-end techniques and factory-tested material as per with quality norms. 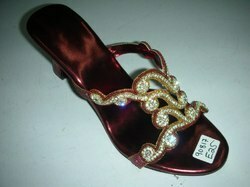 Also, this bridal footwear is given in a variety of sizes, colors and designs as per need by our customers. We are a highly established organization in the domain, engrossed in offering Bridal Footwear. Worn by brides at marriages, the offered bridal footwear is widely applauded by our customers for its fine finish. Moreover, we make the offered bridal footwear available to clients in varied styles and sizes, in order to meet their requirements. Pioneers in the market, we are offering a wide range of Designer Bridal Footwear. Our offered bridal footwear is renowned for their high comfort. We are giving this bridal footwear to our customers in customized options. 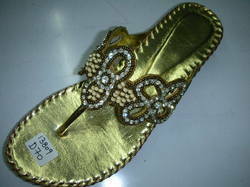 This bridal footwear is manufactured by vendor’s workforce using quality assured basic material. Also, customers can avail this bridal footwear at reasonable prices. Looking for Bridal Footwear ?